What's new at Global Components? Global Components UK LTD have recently received a trophy in honour of our support towards The Read Foundation, which has enabled us to support and contribute towards the education of orphans and needy children. We would like to thank everyone who contributed to our fund raising campaign for Children in Need! All donations made to Children in Need will help disadvantaged children and young people across the UK. Coming soon... Plush Velvet and Sierra! We are introducing a brand new range of upholstery FR Plush Velvet! The Plush Velvet is a brand new high quality fabric, which has an undeniable smooth touch, and is available in various vibrant colours! Our brand new FR upholstery Sierra fabric is an excellent quality fabric with a stylish design, and is perfect for all your upholstery needs! With Sierra's appealing Linen look, this fabric is guaranteed to be a very popular fabric amongst the upholstery industry! 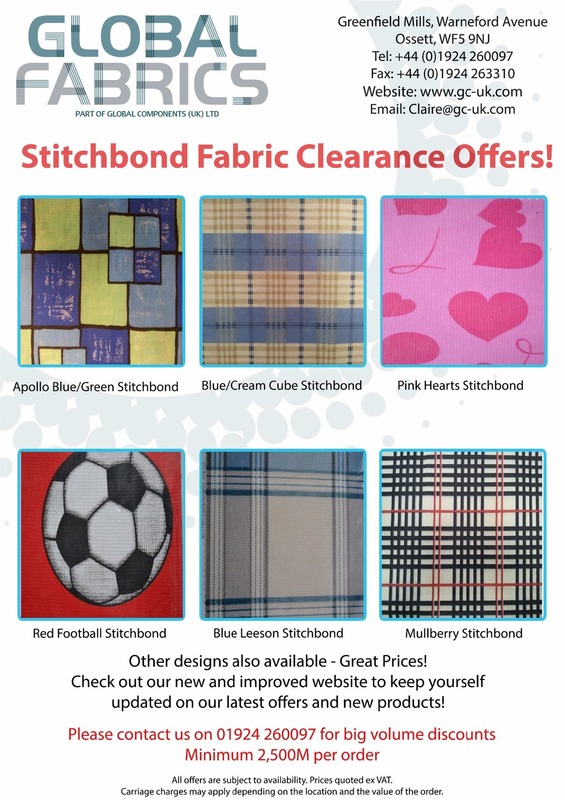 Our Stitchbond fabric clearance has begun, check out the offers below!